Think of a string quartet – a tight ensemble; four players of stringed instruments – two violins, one viola and one cello. They all read from the same song sheet, but with no conductor, their success hinges on their ability to stay in sync. They’re communicating constantly, which results in a very intimate and often very noticeable rapport – a model for teams in the workplace. Allison Eck discusses why in an article on 99U, referring to such foursomes as “a musical metaphor for conversation: each group has its own rhythm, style, and way of coming together as a whole.” Slightly larger ensembles can sometimes work in the same way, with no conductor, just synergy, relying on collaborative communication to keep the music going and sounding good. Switch chairs (and roles) often. It means being flexible – sometimes taking a backseat for the benefit of the group and allowing others to step up, which cultivates group confidence. Don’t just play, but really PLAY your part. 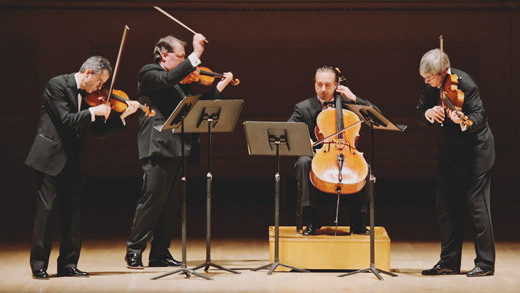 In a quartet, it’s about more than just reading the notes off a sheet of music. It’s about playing those notes “beautifully and with absolute conviction” (it takes emotion to make music). In the workplace, it’s about scrutinizing your individual role within a group and applying some thought to what you’re bringing to the table. Be yourself. There’s room for some comparison to others, but at the end of the day, you should stay fundamentally true to yourself. Imitating others can be crippling and can distance you from being present in the moment, because instead of focusing on the task at hand, you’re focusing on trying to be someone you’re not. Anticipate needs. Become attuned to others within the group – how they’re feeling and what pressures they might be under. Don’t just react. Have your finger on the pulse of the group so you can moderate your responses accordingly. Know the score. In a group, this means having an agenda and knowing what each person in the room has to offer. Forge alliances. Embrace uncertainty. Eck refers to a sort of paradox, where a person’s rational self-constraint and passion come together. “You have to be inspired enough that you want to be leading it [the group], and yet most of the time, you can’t,” says violinist Sarah Darling.